1. Sprinkle ribs with salt and pepper. In 3- to 4-quart slow cooker, place ribs. Cover with onion slices. In small bowl, mix remaining ingredients; pour over ribs and onion. 3. Remove ribs from cooker; place on serving platter. Cover to keep warm. 4. Pour juices from cooker through strainer into 1-quart saucepan. Heat to boiling over medium-high heat. Reduce heat to medium; cook about 5 minutes or until sauce has slightly thickened. 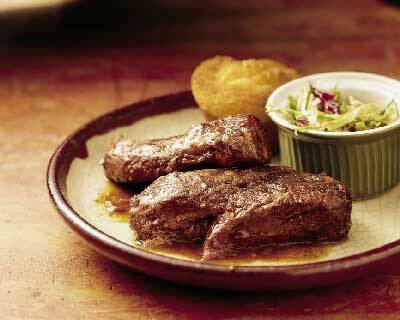 Serve sauce with ribs. 1. Heat oven to 375 degrees F. Line cookie sheet with sides or 15×10×1-inch pan with cooking parchment paper or foil. In medium bowl, mix 1 cup flour and the salt. Using pastry blender (or pulling 2 tables knives through ingredients in opposite directions), cut in shortening until particles are size of small peas. Sprinkle with cold water, 1 tablespoon at a time, tossing with fork until all flour is moistened and pastry almost leaves side of bowl (if necessary, 1 to 2 teaspoons more water can be added). 2. Gather pastry into a ball. On lightly floured surface, shape pastry into flattened round. Using rolling pin, roll into 12-inch round, about 1⁄8 inch thick. Place on cookie sheet. 3. In medium bowl, toss apples and 1 tablespoon flour. 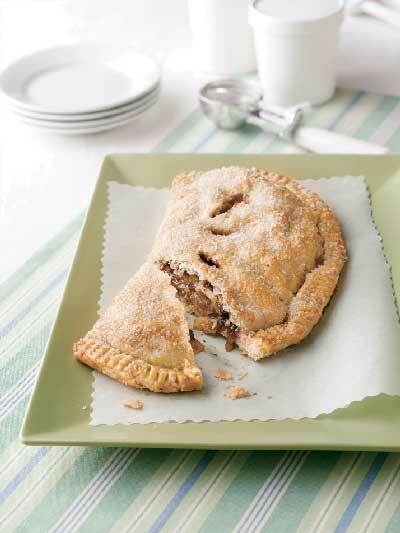 Mound apple mixture on half of pastry to within 3⁄4 inch of edge. Sprinkle with toffee bits. Fold pastry in half over apple mixture. Fold 1⁄2 inch of sealed edge of pastry over; firmly press tines of fork around edge to seal. Brush top of turnover with egg. Cut 3 slits, 1 inch long, in top to allow steam to escape. Sprinkle top with sugar. 4. Bake 30 to 40 minutes or until golden brown. Immediately remove from cookie sheet to serving plate. Cool 30 minutes before cutting.